A little while back I told my son Mykel I was going to make him a bowl for his new apartment and asked what he would like. 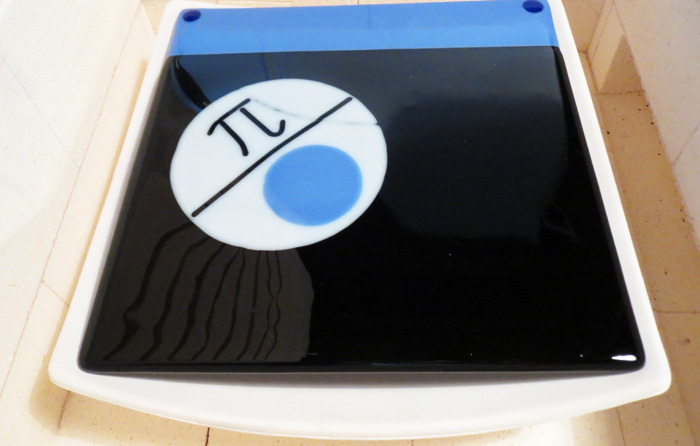 Well, if you knew my son you would not be surprised when he asked for a bowl with the entire number for Pi on it, and in a blue theme. Yes, the entire number. As I am sure you are aware that number is considered to be infinite. I definitely couldn’t make a bowl big enough for that, but not to be beaten I accepted the challenge and did come up with a compromise. 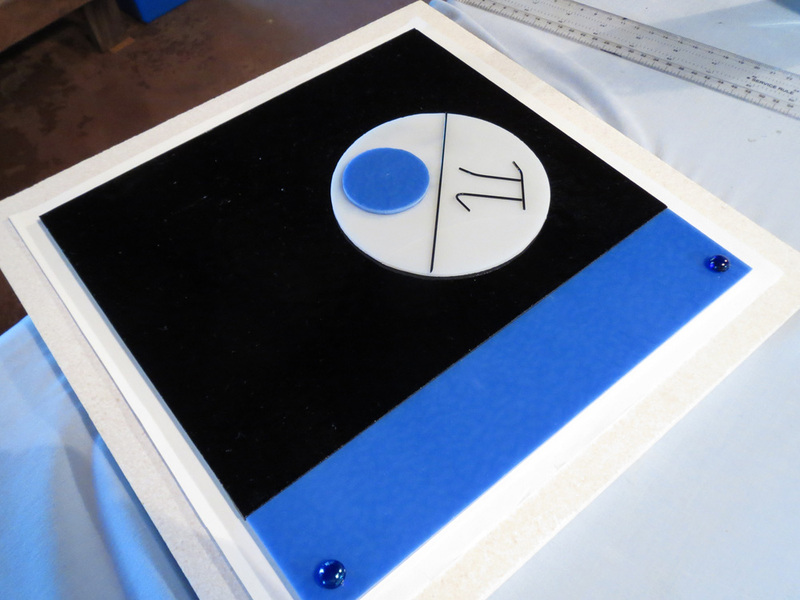 The solution, of course, was not to display a rounded version of the number, but to display the symbol for Pi, which represents the entire number. Smart, eh! Well, I think so. 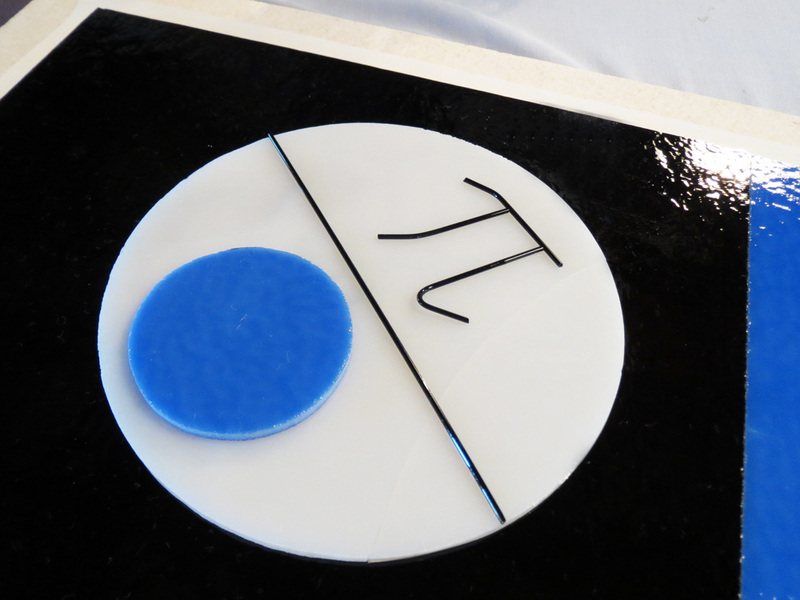 Anyway, my final design was to be a Japanese shaped bowl divided into black and blue sections, with enough symbolism to represent Pi – the ratio between a circles circumference and its diameter. To go a step further I wanted to add a little more interest by suggesting that our Universe is just a little flawed. You will get what I mean later. To start with I cut a 245mm square of 3mm Bullseye Tekta clear. On top of this I added a 245mm x 195mm 3mm black (0100), and a 245mm x 50mm 3mm cobalt blue (0114). These covered the base completely. I then cut a circle of 3mm white, a smaller circle of the cobalt blue, and a length of black stringer the diameter of the white circle. I then cut an arc out of the white circle. Why you ask? Well, this I hoped would represent the suggested flaw in our Universe. Even though I intended to put the 2 pieces of the white circle back together I believed that they wouldn’t fuse fully and would leave a slight line across the circle, hence a flaw. The two pieces of the white circle were then laid up on top of the black section to form a full circle. It was positioned to one side but in a way that the piece seemed balanced, at least to me. The black stringer was placed in a position to represent the circles diameter. The blue circle, representing our Earth, was then placed on the white circle to one side. 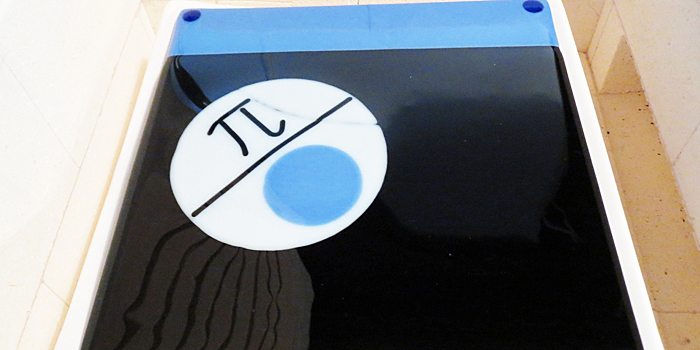 To make the Pi symbol I first cut a couple of lengths of black stringer. Using a candle flame I then shaped the pieces to form the symbol. As this was my first attempt at something like this it took a little time to get it right. I found that rather than bend the stringer myself it was best to let it fall into shape through its own weight. This meant that I had to be careful where I heated the stringer and how I held it to get the curves. Maybe it isn’t perfect, but not too bad. These pieces were then positioned on the white circle on the opposite side to the blue circle. Finally, I placed 2 small cabs of transparent blue in the corners of the blue section. Just for a little balance as the blue seemed too blank. Of course, everything was cleaned well before assembly, and the whole piece was laid up on Bullseye Thinfire paper for a full fuse. The firing schedule is included below. You will notice I held longer at strain release and anneal stages because of the glass mass and size. The firing went well and the piece needed very little cold working before slumping. This was to be my first use of this mold so it had to be prepared with Primo Primer mold release. Prior to this project I had made only one bowl so all of this was quite new for me. Anyway, I simply followed the directions for Primo Primer and continued. You can see in this photo the full fused piece set up on the mold, prior to slumping. The firing schedule for the slump is also below. Unfortunately, I have to apologise as I didn’t take a photo after the slumping, but trust me, it looked great. I was so wrapped in the result I simply forgot to take the photo. Then, with preparing for a trip to see my son in Adelaide (2,000 kilometres away) it continued to slip my mind and now it sits proudly in his apartment. I am a happy man. Anyway, You can see in the last photo the full fuse result and it looked great. The flaw worked and so did the symbolism, I think. Cutting circles is not easy, even with a circle cutting tool. I suggest practice, practice and more. Shaping stringers over a candle can burn you. Be careful. Don’t touch the stringer too close when trying to shape, or wear gloves. Covering a sloping surface of a mold with mold release requires care to not end up with runs. Runs will leave marks on the bottom of your piece if not attended to, and it is almost impossible to fix runs without having to clean the release from the mold completely and start again.